Gelmaxx Australia and the GelMaxx product range are designed to deal with the clean up phase of concrete slurry. GelMaxx was created to economically deal with the challenges the industry faces disposing of concrete slurry. This disposal can be labour intensive, costly and lengthen the time taken to complete the actual job. The Gelmaxx Products are a unique formula using organic materials that make it safe for the environment and the operator. These products are designed to meet the strictest USA Environmental Laws. 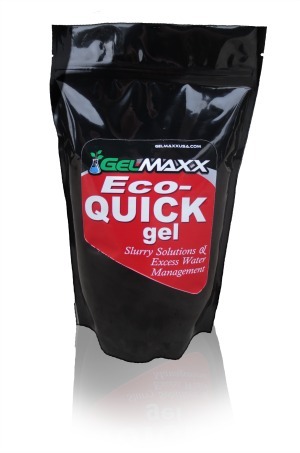 GelMaxx ECO-QUICK gel will absorb slurry solids into a safe material that can be disposed of immediately. ECO-QUICKgel meets the USA EPA Method 9095B paint filter test and the USA EPA regulations for proper disposal methods.20 grams per 3 litres of treated material will create a gel like substance within minutes that is safe to disposed of in any standard waste container or Skip Bin The construction industry is faced wth the increasing regulation for slurry waste water and compliant disposal is at the top of the list. ECO-QUICKgel can reduce the liability and the cost for slurry water disposal. 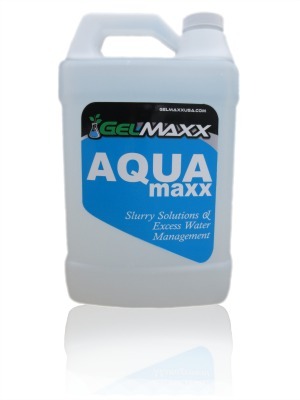 AQUAmaxx is a proprietary blend with special additives that will separate suspended solids from processed slurry water. It separates the solids within minutes.This powerful material will reduce the amount of slurry waste by removing the usable water. This water can be reused back into the job site machinery.It only takes 2 to 4 tablespoons of AQUAmaxx per litre of Slurry.The water can be treated for PH balance and disposed or recycled back into the job-site machinery. It’s easy to use and requires no special machinery to do the job. This amazing product will save water and reduce the amount of waste that needs to be removed. Aquamax is available in a powder form or in a liquid. “I have used the GelMaxx products on countless coring and cutting jobs. I can proudly say that Eco-QUICKgel is a wonderful product to use. Eco-QUICKgel allows me to solidify my slurry waste and throw it away in the job site dumpster. By using this product I can say that I save a lot of money and time”.